Hear ye, hear ye. This be your official disclaimer that everything in this post will reveal details inside the events of aThe RED Tour. If you are trying to keep yourself spoiler free, you’d best avoid this post. June 15. It’s been a long day standing outside the Rogers Center stadium until I finally go indoors. I’m tired already as the opening acts finish their performances. It’s a familiar feeling for me. I’m having second thoughts. Taylor time in a a few minutes. Fearless. Speak Now. Does Taylor have what it takes to bring the magic, the thunder, the spark one more time..? Lights out. RED flashes on the screens. The Taylor Nation starts its national anthem. It’s not a song, it’s a scream in unison of 45,000 attendants. But it is as inspiring an anthem as any country could aspire to have. It’s invigorating, it’s intoxicating and it can mean only one thing: the Princess in Red is about to take the stage. The first notes ring out for State of Grace and the familiar silhouette of the Enchantress casts a shadow on the red curtain, before the curtain flies away to bring us into the RED Tour. I’m on my feet. The tiredness is gone. Ok, not completely gone – I’m still an old guy 🙂 But if the Sparkly Dressed is ready to rock my face off, I’m ready and willing to participate. And that she does. A short pause and a few words and we’re deep into drumming for Holy Ground. How is she doing so far? Pretty damn good. That being said, we’ve seen two of your tour concerts so far. It’s unavoidable to start drawing comparisons at this point. This is not the Fearless Tour. It’s a lot more polished than that, and slightly closer to a concert experience than a theater event. You probably can compare it more to the Speak Now Tour. The elaboration in production is aimed more towards a concert experience, and you can see that in Holy Ground as drummers literally descend from above. The Sparkly Dressed has said there’s a lot less fantasy elements in this one, but you can tell she’s changed them into acting elements. I’m jumping ahead, if we follow the timeline she’s talking again and talking about the Tour’s very predominant color. Which means it’s time for RED. This is a very instrumental performance in which the dancers come out to wave out flags of the same color. There was a guitar duel with Paul Sidoti up front, but that’s it. Which is good, she’s actually saving up some surprises for the rest of the night and to be honest, RED can stand on its own without the need to bring out a Maserati on stage. Taking a cue from Motown, we go into You Belong With Me done like it’s never been done before. It’s a throwback to the 60’s with the Queen of Sparks leading the Starlights into an old school rendition of one of her most known hits. I’ll be honest, I like it as a rendition but wouldn’t have mind at all the original version. I know she’s way past doing the old Fearless version with the band leader outfit – I just get nostalgic sometimes. The backup singers did their very best throughout the concert and my hat’s off to them for taking on this gigantic tour and be willing to sing, dance and dress up with Miss Swift. But even Tay can’t resist some theater, and by the next performance she was in her element. Via a black and while old style intro, we get into the world of The Lucky One. I’m not a huge fan of the music for this song. It doesn’t have any big hooks. However, it’s rich in mythos. The same way that Speak Now brought out the wedding scene, The Lucky One brings out old Hollywood. There’s some influence with Britney Spears’ Lucky both in intent and scenery. The Enchantress comes out in a red dress (it’s opened up, but she has shorts underneath so hush up scandalous people) and long gloves. She also gets the paparazzi chasing after her and dramatically, another star that hugs the spotlight in the end. There has been talk about this one being the only hint of Taylor ever feeling weary of stardom, but the song is said to be based more on another superstar that left Hollywood long ago (Joni Mitchell). If you look it up in your album, the secret message of this song is Wouldn’t you like to know. That takes us into Mean, which in the past has proven to be a quite an iconic performance. This time however, we are not only introduced to Tay and her banjo (and the cutest outfit I’ve ever seen) but to a performance with The Agency bring brought up to the spotlight. Yes, it’s not exactly the couch setting of Fifteen from the Speak Now Tour but it’s as cozy as they got. From there, the Sparkly Dressed surprised me yet again – and for me, that’s not when she comes up with some elaborate production concept but when she decides to highlight someone from the band. In this case, my favorite bass player. In her own words: Ladies and gentleman, boys and girls – it’s Amos Heller on bass! They started with Stay, Stay, Stay until Amos got introduced. He then started to play the Lumineers’ Hey Ho. T-Swizzle loves a good mesh, but don’t worry she did get to finish Stay, Stay, Stay as the stairs rose and she and the bass player extraordinaire disappeared via an elevator. The Blonde With The Sparkly RED Guitar would reappear right back clad in her leatherman jacket plus a flurry of dancers right after a video chronicled her life from 1 year old to the number and title of one of her most energetic tracks, 22. That’s the track that gets her backstage to where she would later would sing Everything Has Changed with Ed Sheeran. However, I’ve skipped over something here. She did also sang a wildcard, secret song. This one however was not from any of her albums, but from a collaboration she did with Tim McGraw and Keith Urban. Here’s the secret song of the night, Highway Don’t Care. Sorry about the sound quality. 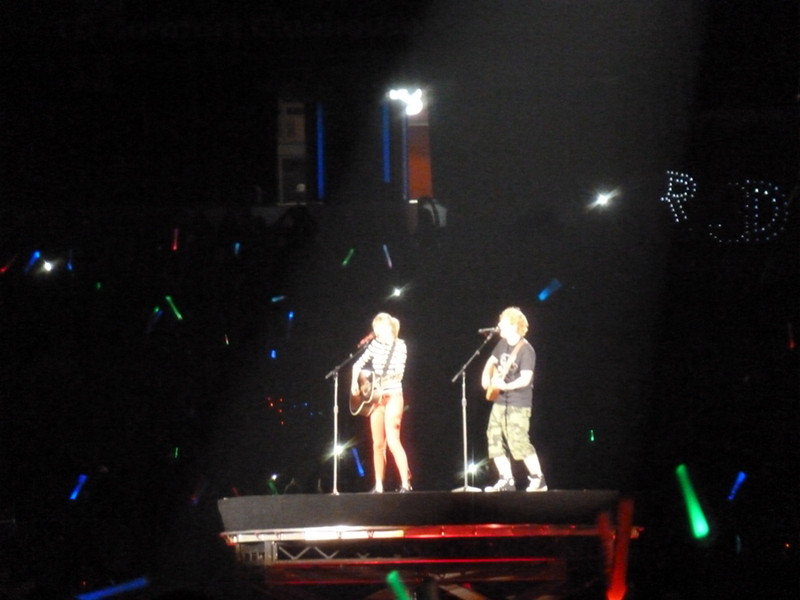 The Queen of Sparks remained on the stage to play with Ed Sheeran and later on performing Begin Again. I’m glad Begin Again remains in the set list. That’s a beautiful song that gets lost and forgotten often. Taylor would make the long trek back to the main stage for Sparks Fly which would feature fireworks, of course. I also got a chance to cheer for Amos, Paul, Grant and Mike as they played around the catwalk. The catwalk is now semi-circular in shape with one corridor running right through it that hides – ok, let’s not jump ahead just yet. And now, the amazing Caitlin Evanson! Yes, as chandeliers descend from the ceiling and the rest of the stage is dark, our fiery redhead fiddle player goes into a dramatic solo that has echoes of Forever And Always from back during the Fearless Tour. It was a moment that I wish I could’ve captured on video, but then sometimes it’s better to just enjoy them live. Of course, this was just an intro to a number that probably was the highlight of the night for many. It was so dark that I almost though Haunted was about to come out of the speakers. But no, it was the dubstep-influenced I Knew You Were Trouble that rang out, as well as the gothic-looking RED troupe. I’m very surprised I got this shot to your left. I had a bunch of people waving arms and somehow managed to get a clear shot out of sheer luck. Yes, this is Taylor on the cold hard ground. Really, I understand the screaming and the shouting, but when you keep looking back after doing it, I suspect you’re just aiming to get noticed and are not really into it. I might be wrong. The true highlight of the night for me was coming up. A red piano appeared at the top and the Princess in Red walked up the stairs wearing a long dark dress.With a few words, she introduced what was the full on dramatic song of the night. All Too Well is perhaps the one song that looks back to the Fearless One’s old roots. She actually went looking for Liz Rose to finish it. It’s got one of those bridges that feels more like a skyscraper since this song builds and builds to a crescendo and a very high register for T-Swizzle. Still my favorite song and despite the fact that it’s Tay and her piano – actually, scratch that – it works because it’s Tay and her piano. It’s time for the Forever and Always Fearless One to bring a classic and it comes via what will be her song for the rest of her career. In previous concert reviews I’ve called Love Story her magnum opus, and thankfully there were not a lot of changes to this song. She did add some ballet to distract us while the stage was being built and a few steampunk-inspired toy ballerinas, showing that she has not forgotten the fantasy elements altogether. I managed to get a great picture (again, not a clue how) of Tay in her beautiful white dress. Treacherous was done in a very minimalistic fashion, but it did reveal another trick that the Princess in Red was saving for the end. As she approached the middle corridor that cuts the semi-circular pit in two, a beam lifted. She then proceed to walk it (“this path is treacherous”) in ballerina fashion. It reminded me a bit of the Innocent performance for some reason. The beam you see would play an important role before the night was over. It wasn’t long until We Are Never Ever Getting Back Together started playing and Taylor would appear in full ringmaster regalia. The beam turned into a crane capable of swinging her above the crowd. Confetti falls and the last goodbye’s and thank you’s are given out. It’s been a grandiouse, over the top, without ever feeling like it went over the top, spectacle. There are things that you’d consider perhaps changing… and perhaps you so much wanted to hear another song, but all in all as tiring as it was you never thought there was a time in which you’d walk out. There was always something else coming. There’s withdrawals after the show. There always are. There are regrets of not having a better seat or plans on relocating to a better spot. But the bottom line is that a great time was had by all, and as concerts go, this one will remain in your memory for a long, long time. The Blonde With The Sparkly RED Guitar will be presenting an award during the 2013 MuchMusic Video Awards this Sunday, June 16. She is nominated for International Video of the Year – Artist and Your Fave International Artist/Group. June 16: The Enchantress is nominated for the 2013 MuchMusic Video Awards. She is nominated for International Video of the Year – Artist and Your Fave International Artist/Group. She is presenting an award on the show. Next Next post: 2013 MMVA: Taylor Swift is Your Favorite International Artist, Canada!